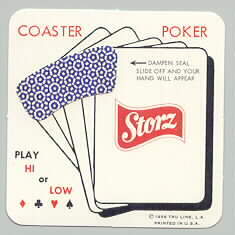 Srorz coaster poker; 2 7/8 inch square.1-sided. Thin cardboard coaster copyright 1958. The seal can be removed to reveal a poker hand. Great shape.